courtesy McCormick.com. 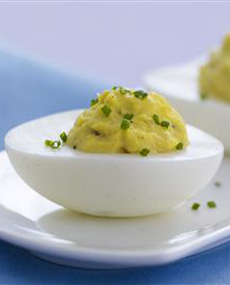 November 2nd is National Deviled Egg Day. Even people who rarely, if ever, eat a hard-cooked egg can’t help plucking a stuffed egg off the tray. You can celebrate plan or fancy. For the plainest, mash the yolk from a hard-cooked egg with some mayonnaise, Dijon mustard and salt, and garnish with sprinkle with paprika. Our Mom liked to mix in pickle relish (although this recipe is actually a stuffed egg—see the difference below). Stuffed eggs were a popular dish as far back as the Roman Empire. There are many different recipes for stuffed eggs through the centuries, but the term “deviled eggs” originated in 18th-century England. “Deviled” refers to the use of hot spices or condiments in a recipe—paprika, mustard, hot sauce, horseradish, chiles, etc. So all deviled eggs are stuffed eggs, but only stuffed eggs with hot spice are deviled eggs. 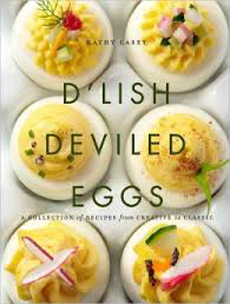 How about 50 new deviled egg recipes? Photo courtesy Andrews McNeel Publishing. *This mixture of crumbled nori sheets and toasted sesame seeds has many other uses. It is delicious on rice and potatoes, with eggs, even in plain Greek yogurt. 1. HALVE the eggs lengthwise and transfer the yolks to a small bowl. Set the egg white halves on a platter, cover and refrigerate. 2. MASH the avocado well in a mixing bowl with a fork. Add the yolks and mash to a smooth consistency. Add the mayonnaise, wasabi paste and salt and mix until smooth. Taste and season accordingly. 3. SPOON mixture into a pastry bag fitted with a plain or large star tip, then pipe the mixture evenly into the egg white halves. Or fill the eggs with a spoon, dividing evenly. 4. TOP each egg half with a little crabmeat, a cucumber fan, a sprinkle of furikake and about 1/4 teaspoon of fish roe.